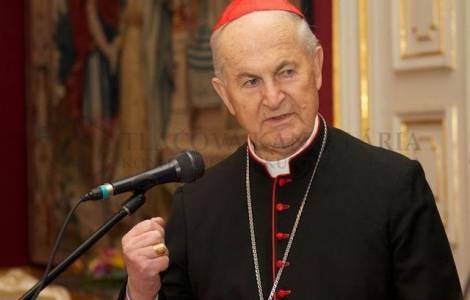 Košice (Agenzia Fides) - Cardinal Jozef Tomko, Prefect emeritus of the Congregation for the Evangelization of Peoples, celebrates two significant goals in these days: his 95th birthday, he was born on 11 March 1924 in Udavský, archdiocese of Košice, and the 70th anniversary of his priestly ordination, which he received in Rome on 12 March 1949. According to the note sent to Agenzia Fides by the Slovak Bishops' Conference, Cardinal Tomko will celebrate both anniversaries on Saturday 16 March in Košice, in the Cathedral of St. Elizabeth, at 10 am. The entire Slovak Church will join the Cardinal. Last Sunday, March 10, the Cardinal celebrated Mass in the chapel of the Pontifical Slovak College of Saints Cyril and Methodius, in Rome. Over 40 priests, diocesan and religious, took part in the celebration, with the participation of several sisters from various congregations, and lay people working in Rome, Slovakia and Bohemia. Cardinal Tomko was ordained Bishop by Pope John Paul II on 15 September 1979. The same Pontiff, on 24 April 1985, appointed him Prefect of the Congregation for the Evangelization of Peoples, becoming at the same time Grand Chancellor of the Pontifical Urbaniana University. In the same year, on 25 May 1985, he was created Cardinal with the diaconal Title of Santa Sabina.